If you’re thinking of taking a Tuscany wine tour with me, you don’t really need to read this article. If you’re not an “expert” on wine it’s not a problem. My tours are open to all who enjoy a glass from time to time, and It will be my job and pleasure to help you through the process. There are no exams. However, if you’d like to appear more competent in a room full of snobs – here’s a semi serious look at the big day. The following suggestions will help you understand what you should be looking for at your first wine tasting, and also how to look just a little more competent. There are two phases, the first is to be done at home, and it’s easy and it’s fun. The second phase is about the big day, and if you’ve done your homework, you’ll do just fine! 1. Buy a bottle of wine and a glass a week or so before the occasion and practice the following very simple techniques. If you don’t know them, it will take a nano second for everyone to see you’re a newbie. The right type of glass is like the one below, and any cheap wine suffice, but if you’re considering a trip to Tuscany go for red. 2. 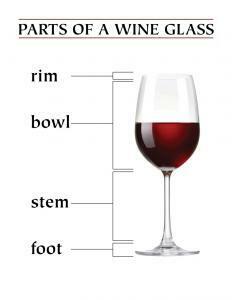 Learn to hold the glass by the stem, or to be even more refined by the foot. Don’t, and I really mean don’t, hold it by the bowl in your fist. Even your intellect will be questioned if you do! 3. Practice by filling the glass ¼ full then incline it so you can observe the edge of the liquid in transparency. Hold it up to the light, or if there’s a white surface, against the surface. This is the first thing you must do the day of your wine tasting. Observe if the edge is dark or if you can see through it. Also observe the color, is a deep red, or violet etc. (More costly wines that have aged could have a slight brown tint). 4. If you really want to look the part, practice the swirling technique. It tells everyone you have some experience, but get it wrong or don’t do it, and you’re telling everyone the exact opposite. It’s called letting the wine breathe and all you need to know is that the process gets oxygen into the wine which releases all the aromas. The easiest way to swirl is to hold the glass to the table by the stem, and make rapid circular movements. You must aim to create a concave cone with the liquid. If the glass is correctly filled by about a ¼ it won’t come out, so go about it vigorously. Once you’ve mastered the technique go on to step 5. 5. Swirl the wine making a cone for about three seconds, then bury you nose in the glass for the same amount of time taking a deep sniff. Wait about twenty seconds and do it again. Try to understand what you can smell and make an association with something else you know. Red wines will generally smell of other red fruits and jams. If the wine has been barrel aged there will be a hint or even a definite note of spice as well. 6. Now take a sip, and very briefly hold the wine in your mouth and swallow. Now take another small sip, but this time keep it in your mouth and draw in air mixing it with the wine. You can find your own way to do this, the easiest for most people is to draw in over your closed teeth. Roll the wine around your palate for about ten seconds, then swallow. Don’t be afraid to slobber! While not the best practice on you first restaurant date with that person you’ve been dying to take out, it’s perfectly acceptable at a wine tasting. At this point concentrate on the sensations you’ve receiving from the wine. With red wines the first thing to observe is the puckering sensation. Did you find it pleasant, or did it bother you? Now observe if the wine is acidic, bitter, sugary or dry, and how do these sensations take you. Do you like them or not? At the end of the day that’s what it’s all about. You either like what you’re tasting or you don’t and it’s the same for everyone. So that’s it! You now know the basic of how to taste wine, now go to the second step here.